Our range of fibrizer are manufactured as per the clients' specifications and requirements, we take care of all the details mentioned by them. All these fibrizer are manufactured using high quality steel or aluminium material.We manufacture them with high quality raw material and in different shapes and sizes. 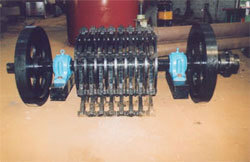 Fibrizers are used for shredding of sugarcane into fibres and open cells to enable prepared cane to be crushed in between the rollers of the mills to extract juice. Our range of fibrizer are manufactured as per the clients' specifications and requirements, we take care of all the details mentioned by them. All these fibrizer are manufactured using high quality steel or aluminium material. We conduct strict quality checks on our product range to ensure their flawless quality before they are sent at the client's end.